April, 1945. 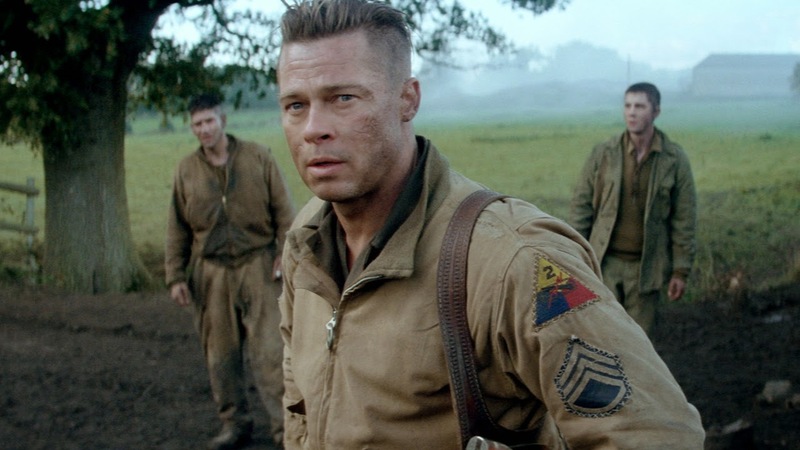 As the Allies make their final push in the European Theatre, a battle-hardened army sergeant named Wardaddy (Brad Pitt) commands a Sherman tank and her five-man crew on a deadly mission behind enemy lines. Outnumbered and outgunned, and with a rookie soldier thrust into their platoon, Wardaddy and his men face overwhelming odds in their heroic attempts to strike at the heart of Nazi Germany. 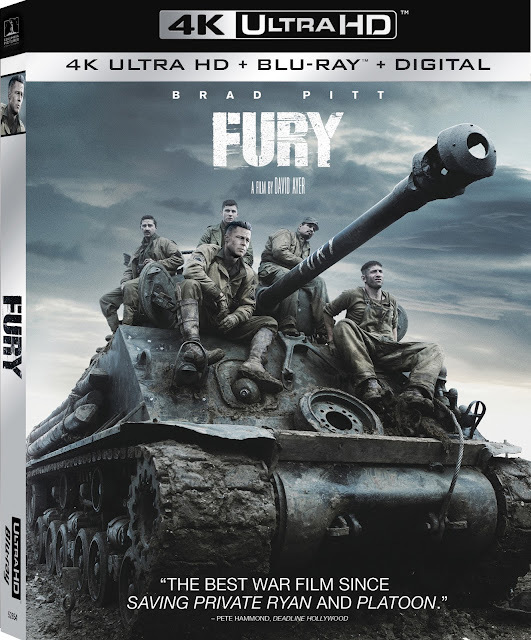 The 4K Ultra HD release of FURY includes more than 30 minutes of rare featurettes, in addition to the hours of content on the included Blu-ray within the set. War films are not my thing. I didn’t pay attention in high school (or college) history class and, as a general rule, I don’t want to see great battles depicted on the big screen. I’m the type of girl that avoids all things in black and white and prefers her violence at the hands of a werewolf or vampire. The Blu-ray cover boasts with a review stating this is “The best war film since Saving Private Ryan and Platoon.” Saving Private Ryan happens to be the first war film I really enjoyed. I was recently surprised at my enjoyment of The Imitation Game, which is not set in battle, but counts as war (and history) related. Fury is the third time a war movie surprised me. This one, is set solidly in the midst of battle, which isn't my usual my cup of tea, but this was well acted, well written and very powerful. An Army Sergeant Don Collier, nicknamed Wardaddy, (Brad Pitt) leads a five man tank crew towards the end of the war in Europe. The men are tired, dirty and have seen and lost too much. They are a battle tested crew that has overcome outrageous odds and they have just lost one of their own. A young typist named Norman (Logan Lerman) has been in the army for weeks and has been sent to replace the deceased soldier. 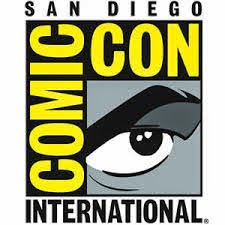 Although they are down a man, Collier and his crew Boyd Swan (Shia LaBeouf), Trini Garcia (Michael Pena), and Grady Travis (Jon Bernthal) do not offer young Norman a warm or friendly welcome. He is thrown into the tank to clean up the blood and body parts of those who came before him as the crew heads out on another mission. Collier takes Norman from the green battle virgin to a killing machine. The audience watches Norman experience more in a day than most people will in a lifetime. At times you aren’t sure if Collier is a terrible man or the best friend a kid like Norman could have. Either way, you watch Norman go from boy to man in the span of just days. The story isn’t particularly unique. I realize that many battle films center around a green recruit thrown into a unit of battle hardened men. What is novel about the film is the way the not so unique story is told. You don’t see back-stories of the men at home with their wives and families. You don’t see their evolution as soldiers from their days in boot camp to eventually making their way to the front lines. You see just a few days in the lives of the tank crew, and it’s amazing how well the viewer gets to know and care for them. 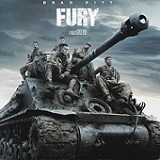 Fury is graphic, dramatic and very intense. The overly sensitive viewer might want to skip this film. It’s not a war time drama with a few battle scenes. This is a few days of life right smack in the middle of the worst of it. If anything about that peaks you interest, I highly recommend giving this film a try. Fury on 4K UHD does look better than the previous Blu-ray release, especially during close ups. The texture from the environment, the tanks, and the people is true to life and helps immerse the viewer in the action. The soldiers aren’t just dirty, the blood and grime has layers. Whether the action takes place inside the tank or even underneath it, detail and clarity remain excellent. Once again, Sony has provided a stellar Blu-ray. Fury’s Dolby Atmos TrueHD 7.1 mix however is quite a jump ahead of the previous 5.1 mix. This new mix is perfectly balanced and carries the appropriate weight and volume to complement the intensity of the visual. The tanks rumble and the bullets whiz by as if you were there. Even with all the action, the dialogue is clear and intelligible and this is the type of UHD you’d use to test out a new sound system. Fury’s UHD offers some new extras while the included Blu-ray contains the previously released extras. There is also a Movies Anywhere digital copy included. Tanks of Fury Documentary - An overview of the making of the film mixed in with real wartime footage and clips from the movie. No Guts, No Glory: The Horrors of Combat - A look at what the real soldiers had to endure and how the film tried to show it. Tiger 131 - We learn of the Allies' capture of a Tiger tank during the war and the efforts to make the film authentic by using a real Tiger tank for the film. Heart of Fury - A look at the interior of the tank with Michael Pena as our guide. Clash of Armor - We learn about the advantages and disadvantages of the Tiger and Sherman tanks and the tactics that they would use in a battle. Deleted & Extended Scenes – Sixteen deleted or extended scenes ranging from 48 seconds to over 9 minutes in length. Blood Brothers (11:09) - A look at the film’s realism, the actor’s preparation and meeting with veterans. This feature also covers the physicality of the roles and the friendships between actors. Director’s Combat Journal (17:32) – Director David Ayer’s experiences and challenges faced while creating the authentic action in the film. Armored Warriors: The Real Men Inside the Shermans (12:12) – World War II veterans talk about their real life experiences. Taming the Beasts: How to Drive, Fire & Shoot Inside a 30-Ton Tank (12:48) – A look at the authentic WWII tanks used in the film and how the actors and filmmakers worked with these metal characters. Photo Gallery – Images from the filming including cast/crew, tanks and equipment as well as veterans. Fury is an authentic, intense and powerful film. I saw one of the actors promoting the film turn away from a clip he brought for the audience, stating that it was too intense of an experience for him to watch. After viewing the film that makes more sense. The film drops the viewer right in the middle of the concentrated action. I’m sure that left a lasting effect on those who were involved, even if they were acting. I’m amazed this wasn’t showered with awards. The film looks and sounds stunning on Blu-ray and contains a solid list of extras. I would have liked a commentary with the director and a few of the actors, but that’s the only thing missing.